Outsourcing in a general sense is a business practice when a company hires external service providers to do the job that traditionally was being done in-house. In IT sphere, outsourcing means the transferring of functions connected with creating, maintenance, and development of IT infrastructure and other associated activities to third parties. It is common practice caused by cost-effectiveness, flexibility, and access to the international market of the most qualified labor force and advanced technologies. Outsourcing may be offshore, nearshore, and onshore. Offshore outsourcing means that you assign IT functions to specialists overseas. Nearshore outsourcing means that a service provider operates in the same part of the world or in a neighboring country. Onshore outsourcing means that you rely on specialists from your native country. 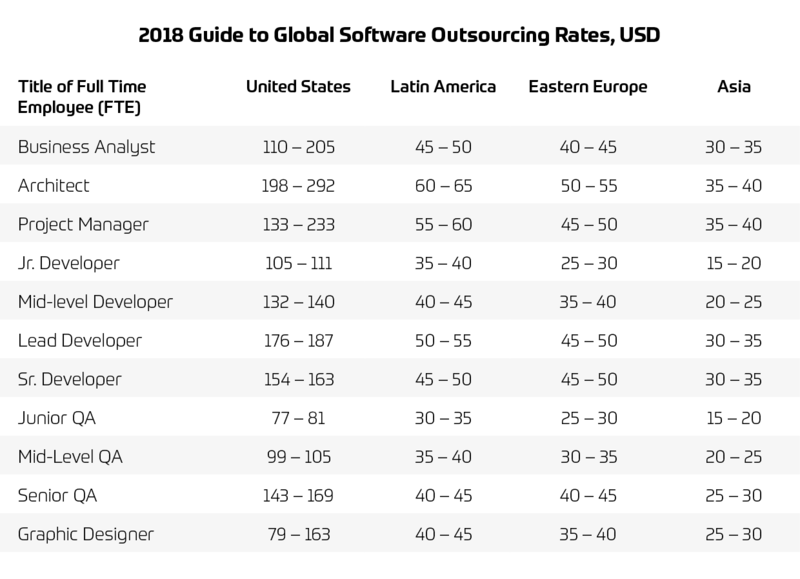 Large market players like Google, GitHub, MySQL, Opera, Skype, Slack, and many-many others use outsourcing of software development widely. It’s equally true for small startups. 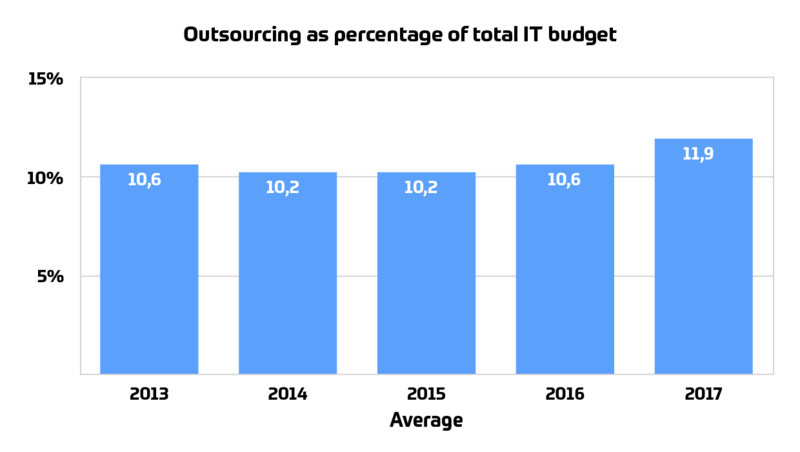 According to the new IT Outsourcing Statistics 2017/2018 study being conducted by Computer Economics, application development is the activity which is outsourced most frequently. IT security has shown itself as the fastest growing outsourced function, along with disaster recovery and network operations. Thus, IT outsourcing services help companies of different size meet the threats and dangers of the working environment. The study found that budgets for outsourced projects kept growing for the past five years and in 2017 the growth was the most significant. 11% — time to market. But these days, IT outsourcing is more often considered as a key to business transformation and innovation. Let’s look at advantages of delegating activities connected with information technologies in details. 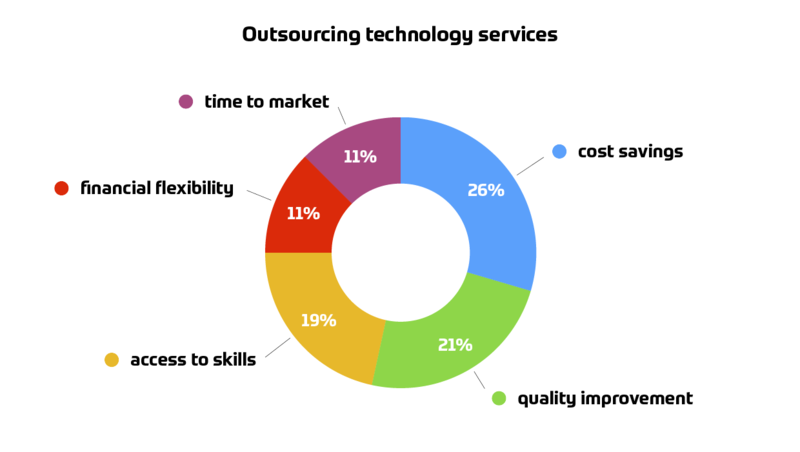 Cost optimization — probably the most common driving force to outsource software development or associated functions. You needn’t spend time and money on team staffing: just imagine the whole process of talents search, interviewing, recruitment and training. In IT sphere, some positions may close for months. In case you haven’t an in-house HR manager, add here costs on outsourced recruiters. Rates of developers and other technical professionals vary from country to country. Specialists from countries with lower life cost will cost you lower. It doesn’t mean that you should search for the cheapest specialists. It means that you can hire equally or even more skilled specialists for less money. The other point of savings is no need to pay taxes, bonuses and to maintain office premises and equipment. Your IT outsourcing provider has already included all the social payments and overhead costs in the hourly rate or project estimated budget. When you come to an international market for software development specialists you get the access to the pool of labor force which can be much better than in your domestic labor market. IT industry’s developing unevenly in different countries, and in some locations, there is a shortage of professionals. 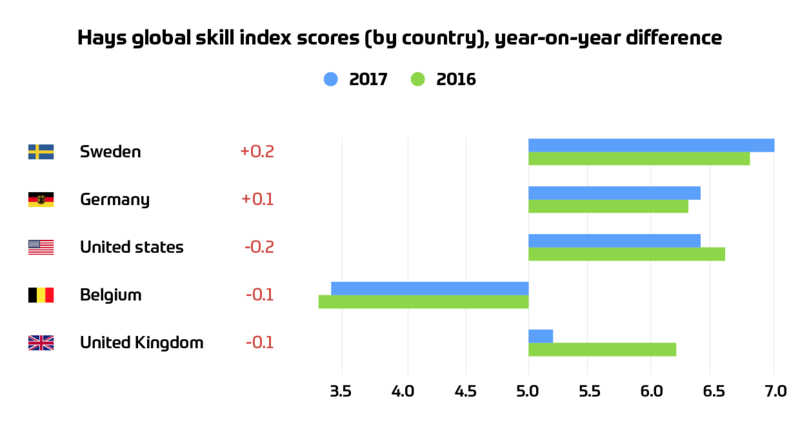 Hays Global Skills Index shows the stress level of the labor markets of 33 countries. It measures how easy or difficult it is for companies to attract and retain the most talented personnel. Such developed countries like Sweden, Denmark, Germany, USA are under great pressure when it comes to filling the positions of technical specialists. Entrusting your project to IT outsourcing company, you can choose the relevant skills level of the team or find a team that already has the proper experience. take advantage of external expertise. Thus, you can solve your business tasks and raise your business to a new level by the adoption of new technologies. Apart from the economy you save the time and reduce time to market. When you outsource, there is no need to waste time on searching, hiring and training personnel, you can proceed with the project development immediately. Outsourcing development teams leverage effective agile methodologies of development which also save your time. Outsourcing teams are much more flexible than in-house ones. They are easy to scale depending on the work volume. For example, you need fewer specialists to support software than to build it. It is the best decision for the companies working on a project-by-project basis. You won’t have to cut your own staff when there are no ongoing projects. You also have the opportunity to hire different teams for different projects. The decision to outsource software development is often accompanied by doubts and uncertainty stipulated by potential risks. We’ll reveal the most common pitfalls and advise on how to avoid them. Communication risks mainly occur when you opt for offshore outsourcing of software development. In this case, cultural, language, and even time zone differences may affect the communication process considerably. To minimize the risk of communication breakdown opt for an English-speaking team. Consider a time zone of a country of outsourcing destination. You should have at least a couple of hours intersection to hold meetings with your team. Apart from time and language, culture similarity means a lot. In most cases, collaboration with people of similar culture runs more comfortable and smooth. To provide effective communication, you may appoint an in-house employee responsible for communication with an outsourcing team. Financial risk means you can pay more than it has been arranged in advance. To avoid unexpected money infusion, opt for the fixed price projects or when it’s impossible — try to keep your requirements within the budget. Remember, every new feature means new money input. The lost of managerial control is considered to be the widespread risk of software development outsourcing. It’s much easier to monitor the development process when software engineers are sitting next door. As a result of insufficient control, you can get software with poor performance or simply not to get the product you’re expecting to get. To reduce the influence of the managerial risk you should maintain constant contact with an external development team through the appropriate communication channels. The key to minimizing of the managerial risks lays in the correct approach to the partnership. Although outsourcing ensures time and costs savings it still requires your active participation. No one is more interested in the project outcome than a product owner. Consider well-established vendors that can provide their case studies and real clients’ testimonials. Take a closer look at companies that already have experience in your business domain and similar software products in the portfolio. Consult on your software project to evaluate communication skills and expertise of a potential partner — an expert outsourcing company will give you constructive advice and share their experience. Share your vision of the final product with the development team and document all the requirements to minimize possible confusions and misunderstandings. Check the product idea viability and the team professionalism by developing the minimum viable product. Some products fail not because of a service provider but because they don't match target audience needs. Pay attention to the legal side of the partnership, including NDA and the intellectual property ownership. Keep constant communication on the project to make sure it’s moving into the right direction. Never lose control on the development process. We will tell more about the possibilities of your business, and we will be able to realize all your wishes in real long-term projects.